Porcelain veneers have the appearance of natural teeth, meaning people will not be able to tell if you are wearing them. The advantage of using porcelain to create the veneers is due to their ability to offer the same resilience and strength as one’s natural teeth. Dentists are able to change the shape, color, and size of the teeth to fit the person’s mouth. Porcelain veneers is not the only option so be sure to ask your dentist about other options available to correct your teeth. Be sure to convey to your dentist the level of improvement that you want to see in your smile and the solution that will help you achieve it. In order to begin the process, the dentist may perform a smile analysis and may make you wear mock-up veneers to give you an idea on how you would look with them. In some cases, they may present you with a picture, showing you wearing the veneers. If the porcelain veneers are able to create the desired look you want, you can give the dentist a green light to begin creating veneers customized for your mouth. What Else Should You Know About Porcelain Veneers? Porcelain veneers contain a series of many ceramic layers, which replace the tooth enamel, and an adhesive layer. To place the veneers in the mouth, the dentist will remove a small amount of enamel from the tooth. In doing so, the dentist is creating room for the veneers and assuring that proper tooth function remains undisrupted. At this critical point, it is pertinent to create a strong bond between the veneers and the original tooth. Next, the dentist will proceed to put light-sensitive resin between the veneer and the natural teeth. The dentist will take a curing light to harden the resin into place. If you think porcelain veneers are the right choice for you, you should ask your dentist. When Porcelain Veneers Are the Right Choice? People whose natural teeth are discolored and misshapen should ask their dentist about porcelain veneers. Porcelain veneers are also a good choice for people with gapped and fractured teeth. In other instances, teeth whitening may not be enough to remove some stains from their teeth thus doctors may suggest people to think about outfitting their mouth with porcelain veneers. 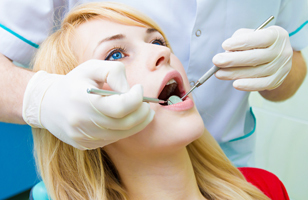 People will have to care for their porcelain veneers, as bacteria and gum disease can still develop. They need to use toothpaste with fluoride, rinse their mouth with mouthwash, floss and brush their teeth, and most importantly, visit their dentist. The dentist will be able to keep a check on your porcelain veneers to make sure they are in place and functioning properly. If you are considering getting porcelain veneers, you should come in for a consultation. Visit Pearland Family Dentistry to talk with one of dentists so they can tell if porcelain veneers are the right solution for you or if you need an alternative solution to restore your smile.